Click here to view sample documents. 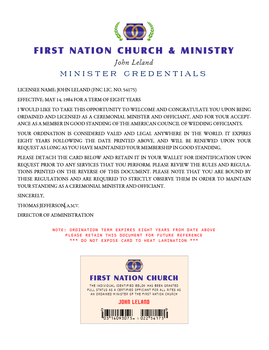 Your First Nation Ministry ordination credentials package includes all of the forms and documents required to legally perform all common rites, including weddings, vow renewals, memorials, baby blessings and other ceremonies. Our documents are professionally and elegantly designed, and are personalized with your name at no additional charge! 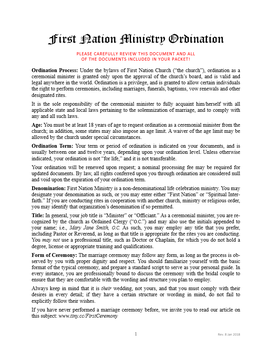 Other organizations offer "free" online ordination, then charge more than we do (including shipping fees) if you decide you want actual printed documents — which are required in most jurisdictions. 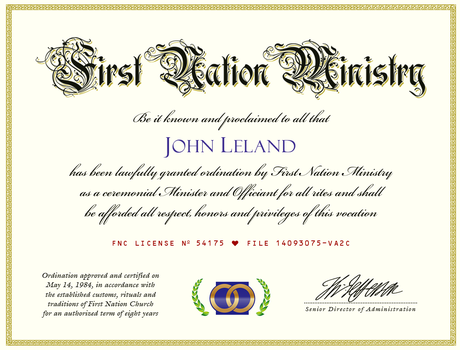 Remember, if you're ever called in to court to prove your legal status as a ceremonial minister, a screen shot of your "ordination certificate" is not acceptable. 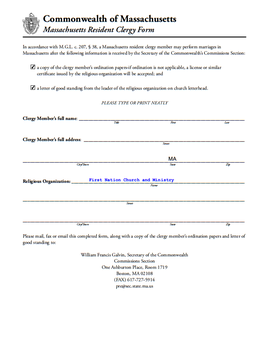 What's Included In The Ordination Package? Complimentary training through the Academy of Civil Wedding Officiants (ACWO)*. Performing a ceremony outside your primary location or home state? As part of your complete ordination package, we'll provide you with detailed information and instructions on performing weddings in other jurisdictions. Simply contact us and let us know where the ceremony will be, and we'll take it from there! 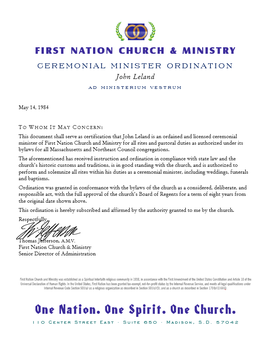 * — Item not included with basic (single ceremony) ordination. Certificate in basic package is not gold-foil embossed. 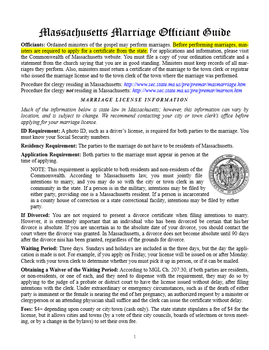 Images shown are examples only, and represent the documents included with the Massachusetts ordination package. Packages for other states will include the appropriate documents and forms for that jurisdiction.